Generally speaking, I feel like a healthy person. Sure, my blog revolves mostly around dessert, but considering the diva-like demands of my sweet tooth, I do alright. Or so I tend to think, until I hang out with actual healthy people and it occurs to me that I could stand to be healthier. Ack. Recently, Taste Tester’s cousin was in town visiting from Telluride, CO. As nice as it was to have him around, I was a little bit jealous of how much energy he has. As an active outdoorsy person and a healthy eater, he seemed to have double the energy I do, but he also likes and appreciates good eats. So when he recommended a new energy bar to me, I figured it might be a combination of the two (healthy and good) and decided to hunt it down. The variety of Kate’s Real Food Bars that I picked up (there are only 3 in the pic above, but I bought 5) were all pretty different and boasted a range of textures and flavors. Some were thicker and densely packed with nuts, seeds and hunks of dried fruits (yum!). Others were thinner and quite airy, with a texture similar to a rice krispie treat. The Peanut Butter Dark Chocolate w/flax and hemp had an extra boost of texture and rich flavor from the seeds. The only other bar I can think of that looks similar to it in texture is ProBar, but I remember those being overly-seedy and didn’t particularly care for them. I really liked the combo of dried apricots, bananas and raisins in the thicker bars like the PB&H Milk Chocolate. That one was on the edge of too sweet but it was still really good. The one bar that I was on the fence about was the Dark Chocolate Coconut Spice. The indian-inspired spices are *very* strong and definitely took me off guard. It was a little whoa at first but grew on me. Overall though, the winner was the PB Dark Chocolate w/flax and hemp. I told it’s wrapper so, but it just sat there. Oh, well. The only thing that irked me about my tasty energy bar purchase was the “&H” that appeared on some of the flavor descriptions (like “PB&H Dark Chocolate”). Does anyone know what that might mean? I am lucky not to suffer any food allergies but as someone who is conscious of ingredients for loved ones who are, I didn’t like how unclear this abbreviation was. And even after looking on the back of the bar and their site for a bit, I’m still not sure. “& Honey”? “& Hemp?” “& Happiness?” WHAT DOES IT MEAN?! (It looks like they might have maybe ditched this on their new packaging, but the curiosity remains). I’ll counter that with a good point though: while doing research on the “&H”, I found that their site recommends that you can freeze the bars if you buy a large stash. 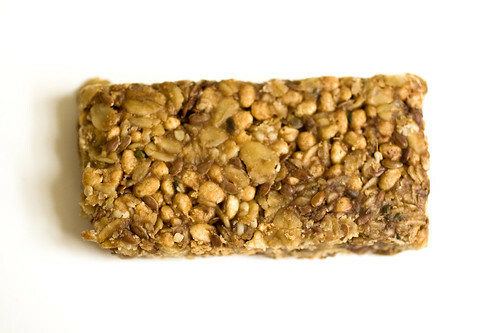 I never would have considered freezing an energy bar and now I’m curious how well it stands up. Interesting point, website! Now before you call me a total health dummy, I am aware that eating healthy snack bars will not give me a permanent energy boost and instant six pack. So last week I got back on the horse and started working out again, for the first time since early September. I’m admittedly much lazier in the colder months, since I don’t have to wear a bathing suit and no one can see the evidence of my laziness through my winter coat. But another healthy friend (hi, John!) reminded me that you do feel a lot better when you work out. And he’s right. 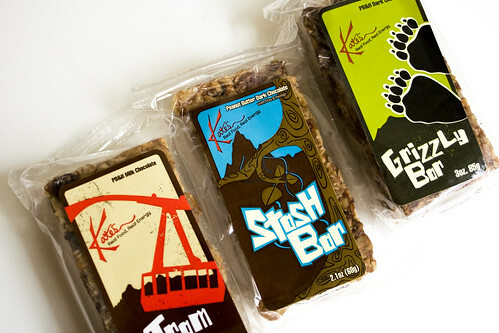 If you’re in the mood for a tasty and healthy snack that can fit in your pocket but still fill you up, pick up some of Kate’s Real Food Bars. And if you’ve fallen off, get back on the horse with me. 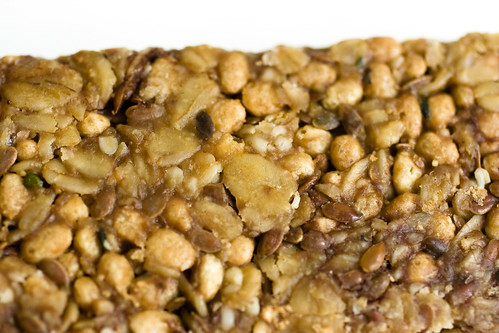 The Peanut Butter Dark Chocolate w/flax and hemp bar looks and sounds SO delicious. I am a cereal and oat bar addict. They are easy to carry anywhere and serve as a great before and after exercise meal. I’d go for the denser higher flavours to provide me with more energy.